Yeee-haw! 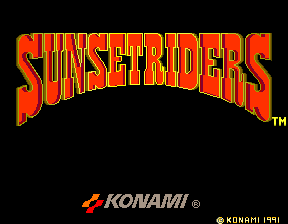 Saddle ‘em-up and git riding with those Sunset Riders! >ahem<. OK, that was probably the most clichéd and downright cringe-worthy opening of any review I’ve ever done. I apologise unreservedly, and promise that the rest of this review will not contain any more “Wild-West” themed jokes, puns or clichés whatsoever. No siree, not a one. So, what in tarnation is this game about? 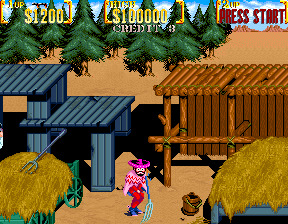 Well, the “Sunset Riders”, as far as I can gather, are a bunch of Cowboys out to clean up the town and bring in the outlaws, dead or alive. Basically, it boils down to a side-scrolling run-and-gun platformer, similar in vein to Rolling Thunder more than anything else. In fact, that’s probably the best comparison you can imagine, you can hop between the ground and a higher platform, nip through doors to hide or grab power-ups (occasionally getting a kiss from a bar floozy and perhaps a drink too), and one hit equals death. 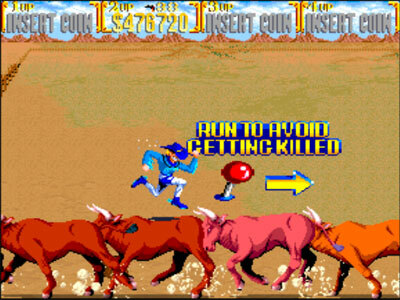 In fact, this game is punishingly difficult, especially when you’d more than likely find it set to at least “normal” difficulty in the arcades. The graphics are knee-slappingly good, with some hilarious touches, such as the standing on a rake and getting slapped in the face, or getting blown up by the spectacularly tall explosions, but don't worry, you'll no doubt get to see all the funny death sequences since you are so likely to die with alarming regularity. 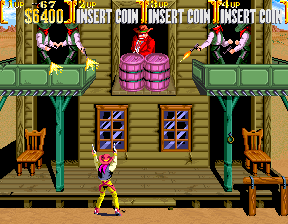 You've got a choice of four heroes to take the game on, there's Steve and Billy who wield pistols akimbo (firing 2 bullets at a time in slightly different directions), then there's Bob and Cormano with their shotguns, which basically just means bigger bullets. 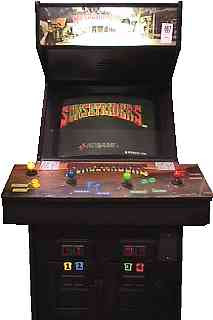 I've never seen one, but apparently the game was available as a 4-player simultaneous cabinet as well as the standard 2 player one. Whether this would work well with the massive cartoony graphics, I don't know. The side-scrolling shooting action is occasionally broken up by different styles of gameplay, for example you’ll find yourself riding a horse (chasing a train) and there’s also the occasional “Shooting Gallery” level, where you basically have to flick your joystick to one of the nine possible positions and hit fire as the outlaws pop up. Whilst I did play through the whole game once (cost me a bloody fortune, it did), it would take an enormous amount of skill to get through the game in one credit. But then you wouldn’t see all the hilarious graphical touches… it’s a two edged sword if ever there was one. Add to that the great sound and gameplay, it’s well worth a few credits to try again. If you can find it.